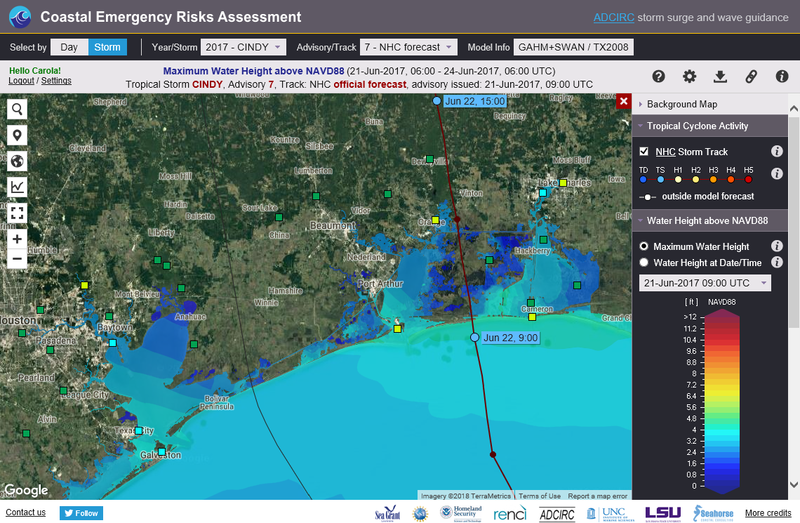 In June 2017, as Tropical Storm Cindy was nearing the Texas and Louisiana coastlines, the Texas State Operations Center and the Texas Department of Transportation (TXDOT) — which operates the ferries along the Texas Gulf Coast — were closely monitoring coastal water levels. They needed to know how high the water would rise because they are required to shut down the ferry from Galveston to the Bolivar Peninsula if the coastal water level exceeds four feet above the mean tide level. The decision process to shut down the ferry took on even greater significance during Cindy because the Texas National Guard planned to use the ferry to make the 20-minute trip to the Bolivar Peninsula to perform welfare checks on the residents there. Without that ferry, they would have to spend time and additional resources driving all the way around Galveston Bay to access the Peninsula from the opposite side. And with Cindy’s rising waters, TXDOT was planning to shut down the ferry as a precaution. However, the Texas State Operations Center personnel were also monitoring the live storm surge guidance displayed on the CERA website. The site showed the real time water levels at local tide gages as well as ADCIRC model guidance for future peak water levels during Cindy. The model guidance indicated that peak water height was unlikely to exceed four feet, and the Texas State Operations Center personnel relayed this information to TXDOT. As a result, TXDOT made the decision to keep the ferry open, and the Texas National Guard used it to safely and successfully complete their welfare checks on the Bolivar Peninsula. Post storm analysis later showed the ADCIRC predictions came within 0.2 to 0.3 feet of the actual recorded measurements, and that the water levels never exceeded the threshold for shutting down the ferry. Tropical Storms like Cindy occur much more frequently than the storms that grab the headlines, and their accumulated damage and disruptions add up over time. Live storm surge guidance during Cindy prevented unnecessary disruption and enabled smooth emergency response operations to continue safely.